A slipper clutch (also known as a slider clutch or back-torque limiter) is a specialized clutch developed for performance oriented motorcycles to mitigate the effects of engine braking when riders decelerate as they enter corners. The slipper clutch consists of two bases, one with dog clutches and ramps with ball bearings, a splined hub, and clutch plates. In normal operation, the dog clutches mate, driving the transmission. 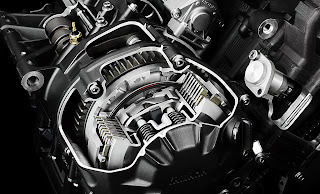 When a back torque comes from the transmission, the splined hub slides up the bearing ramps, disconnecting from the clutch plates. They are designed to partially disengage or "slip" when the rear wheel tries to drive the engine faster than it would run under its own power. The engine braking forces in conventional clutches will normally be transmitted back along the drive chain causing the rear wheel to hop, chatter or lose traction. This is especially noted on larger displacement four-stroke engines, which have greater engine braking than their two-stroke or smaller displacement counterparts. Slipper clutches eliminate this extra loading on the rear suspension giving riders a more predictable ride and minimize the risk of over-revving the engine during downshifts. Slipper clutches can also prevent a catastrophic rear wheel lockup in case of engine seizure. Generally, the amount of force needed to disengage the clutch is adjustable to suit the application. Slipper clutches have been used in most high displacement four stroke racing motorcycles since the early 1980s. Slipper clutches were introduced in the 1970s by John Gregory and TC Christenson on "Hogslayer" the most successful drag racing motorcycle of the 1970s. Made of bronze sintered plates from an earthmover and a Rambler 2 speed transmission, the drivetrain let TC reach 180 mph in the quarter mile. Slipper clutches are used on many current sport bikes. Slipper clutches have also been used to a lesser extent on automobiles, primarily those powered by motorcycle engines. They can also be found on racing remote control cars. Some experimental aircraft use a slipper clutch to control torsional resonance in the drive train and protect the engine from shock in the event of a propeller strike. A slipper clutch for an automobile was patented with a French priority date of 1953 to J.Maurice ETAL. The principle of this slipper clutch was exactly the same as found in modern motorcycles. Chatter, sometimes called for to justify bad lap times by the rider, is a complex auto-excited vibration. Auto-excited means that the vibration is not generated by external forces but once triggered, generates a self-sustaining vibration mechanism. First of all, it has to be said that for vehicles in racing trim, the vibration mode of the rear wheel, front wheel and transmission are characterized by similar frequencies, typically around 20 Hz. The vibration modes of the front and rear wheel depends on unsprung mass and radial tire stiffness where the transmission is defined by the rear wheel inertia, engine inertia and transmission stiffness in which the bodies are more flexible than the coupling flexibility and tangential stiffness of the rear tire. The different modes are coupled to each other, for example the rear wheel oscillation mode causes vibrations in the front wheels as well, although in lower extent. Another rear wheel oscillation mode is torsion which is coupled with the transmission vibration mode. Let's look at an example of chatter on a 2-stroke 250cc bike when braking, before entering a corner. As can be seen from the graph, during braking, at a certain speed, the rear wheel starts to wobble and in a short time, the vibration is transmitted the front wheel as well. The unsprung masses oscillate with high accelerations which causes the wheels to bounce on the road surface and thus momentarily, loss of contact occurs. The oscillations are transmitted to the engine which then shows an irregularity in the periodic motion, with a frequency equal to that of the vertical rear wheel. We begin by observing the graph that represents the speed. The shape of this graph during braking, points out that the phenomenon begins when its value is approximately equal to 135 km / h or better 37.5 m / s.
If we divide the speed by the wheel radius, which is approximately equal to 0.3 m, we obtain a rotation speed of 125 rad / s which is precisely equal to 20 Hz or 20 cycles per second. At this speed, the irregularities of the road surface and small unbalances of the wheel excite the vertical mode of vibration of the rear wheel. The rear wheel begins to vibrate at the natural frequency of 20 Hz. But why is the amplitude increasing so dramatically and only stops when it reaches a certain limit cycle? To understand the origin of the phenomenon we must analyse the dynamics of the rear wheel. During braking, the peripheral speed of the wheel is less than the speed of the motorcycle: it therefore generates a slip or better, a longitudinal sliding of the wheel that generates the braking force to the ground. The slip can reach values of 10-20%, with the wheel locked slip is 100%. But slip may not be constant, namely present fluctuations due to various phenomena that we will try to explain with the figure below. - The tangential stiffness of the wheel and sprocket generate fluctuations in slip when the wheel itself is undergoing torsional stress. 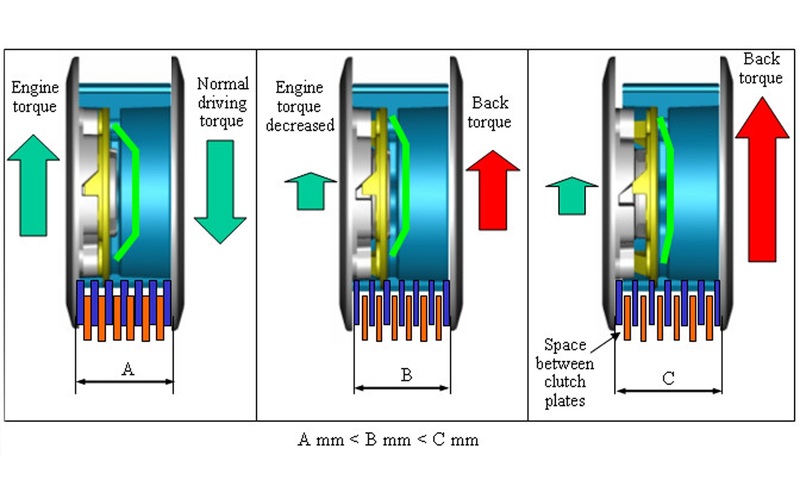 The longitudinal sliding of the rear wheel consists of a constant and a fluctuating part. or with a combination between the front brake, rear brake and engine. The modes of vibration of the wheels are stable i.e. they tend to fade naturally, the mode of transmission on the other hand, can become unstable depending on how the braking is performed. In particular, the mode of vibration of the transmission can become unstable by engine braking. This instability leads to rapid increase of oscillation until the limit value is reached, which is determined by the amount damping present. When we look more closely at what happens and we observe the following figures, in particular, the time interval highlighted in blue. The vehicle speed is decreasing and equal to about 23 m/s within the interval. The angular velocity of the wheel is about 60 rad/s, which corresponds to a peripheral speed of the wheel of 18 m/s With a vehicle speed of 23 m/s, this indicates that the rear wheel is braking. The angular velocity fluctuates from 40 to 80 rad/sec, the vertical oscillation of the wheel causes the detachment and therefore subsequent contact of the tire with the road surface. The vertical load fluctuates between zero and 1500 N. Consequently, the braking force shows a similar trend. Only when the wheel is on the ground, the braking force is not equal to zero, in other words, when there is a normal load acting on the tire a braking force can be applied. The vertically oscillating wheel touches the road surface when the wheel speed is maximized (point B). The braking force is in phase with the fluctuation of the sliding and therefore performs a positive work in the time interval BC, which translates into an increase of the torsional oscillations of the wheel. It's like a swing, if you push the swing in the direction of the velocity when it is in the lowest position in which it has the highest speed you will increase the amplitude of oscillation. But you are interested in eliminating the chatter! It is not easy but now that we understand, something you can do is: decouple the modes, so that they have different frequencies. It means upsetting the bike and it is not a good solution in racing. You can also work on the stiffness and the damping of the tires or the flexible coupling of the anti-hop clutch on the structural damping of the wheels. For the frame, you could try with dynamic absorbers calibrated to 20 Hz.